I feel as though I should start this post by taking a moment to congratulate ourselves for making it to Friday. Am I the only one who feels the need to celebrate the fact that I made it through the week in one piece? Between Miss L.’s new school routine, Mr. Hoff’s travel schedule for work, my teaching job (and photography jobs), I think I might have been hanging on by the teensiest of threads this week. But we did it. Go us! Woohoo! We must be rock stars. I might be guilty of making things harder on myself than they actually need to be. 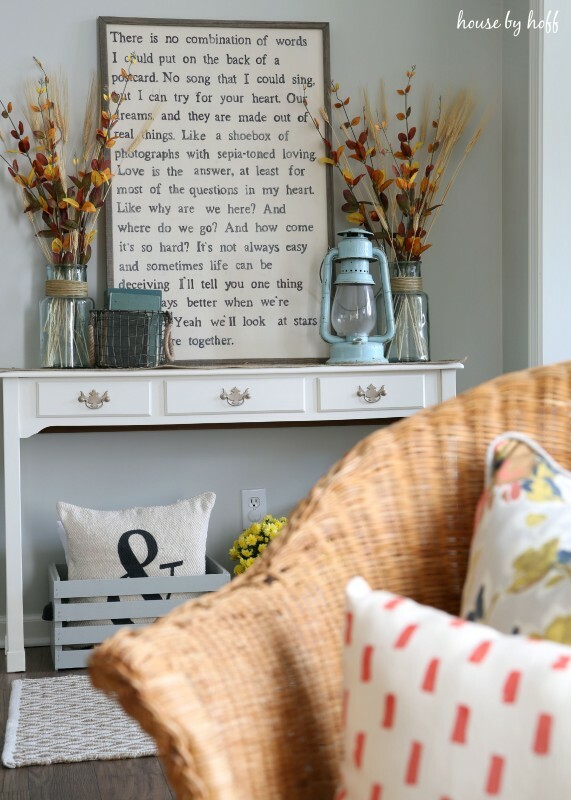 I was obsessively working on this song-lyric sign and fall decorating this week. At first I was sad to take my summer decor down and begin transitioning to fall, but once I got started, I totally got into the fall spirit. 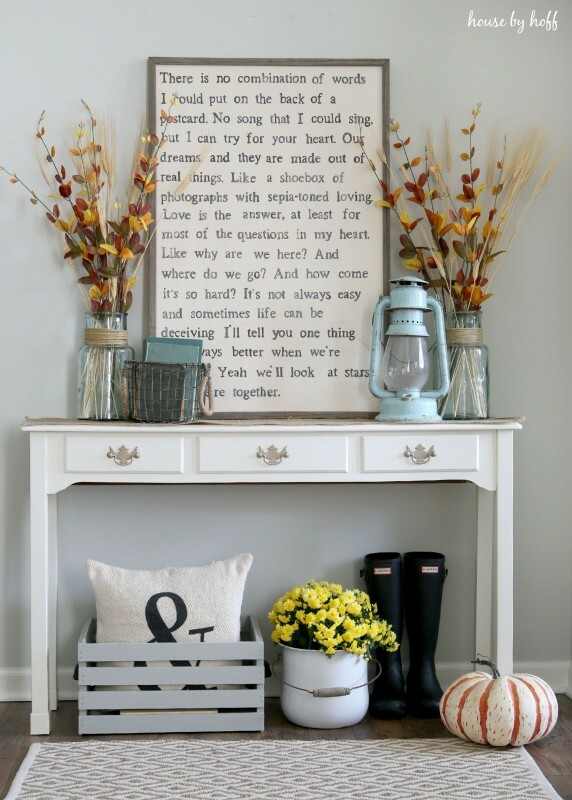 There’s something comforting about fall decor, am I right? Things just feel cozier and warmer. 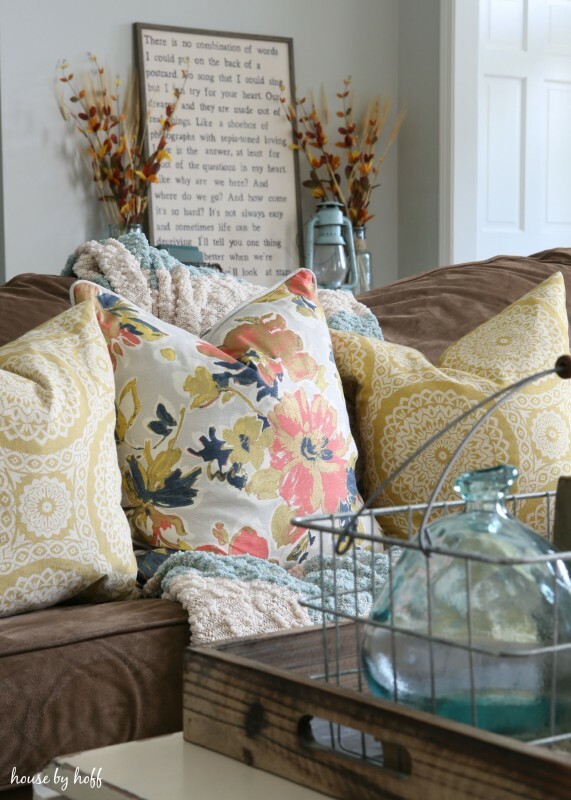 I must admit, now that I have my house “fall ready” I’m ready for the cooler temps and changing leaves…bring ’em on! Don’t forget to link up with us this Sunday at 7:00! 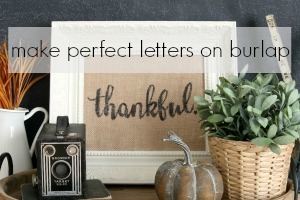 Love love love your sign, April and it works perfectly in this pretty Fall vignette! I was feeling sad about taking down my Summer décor too, but once I got started, I am SO ready for Fall too. It was almost 100 degrees here yesterday, so that crisp Fall weather is welcome anytime now! Thank you, Christy! xo We aren’t far behind you….it’s supposed to be 90 degrees today….wha?!? Amazing! This makes me so excited about Fall. I’m obsessed with your sign. Will you share how you made it? 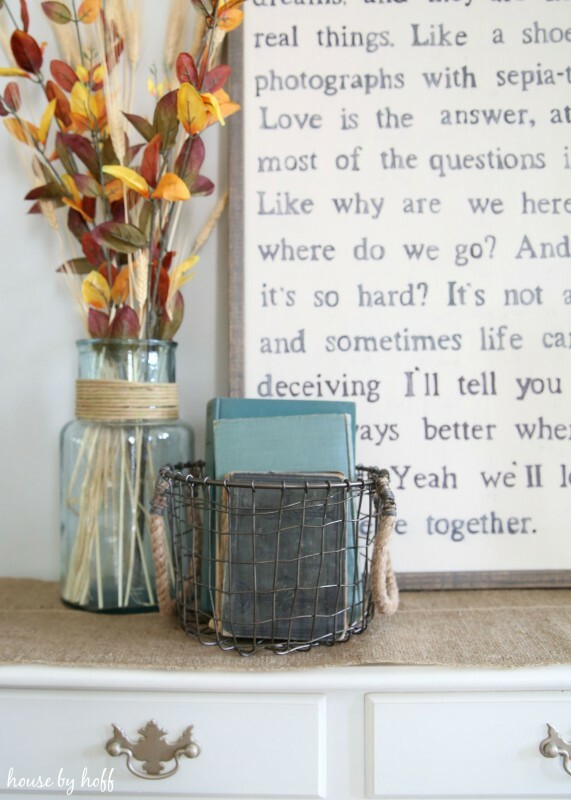 What a pretty fall vignette you created, April. I hope you share how you created your pretty sign. I’m also a teacher and I’m sneaking a peek at your vignette while my kids take a common assessment. 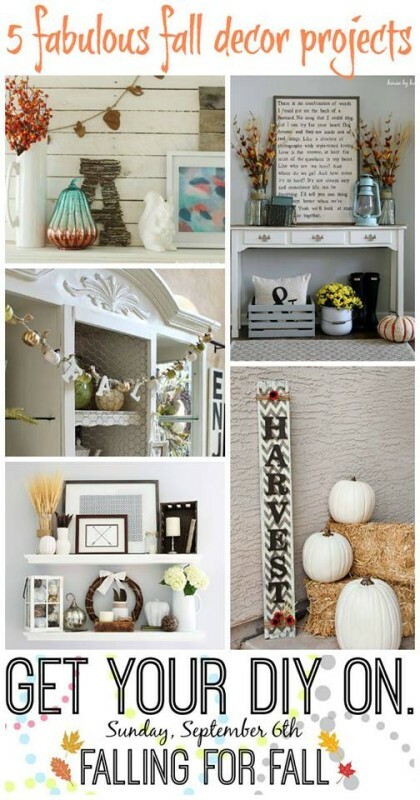 I’m hoping to do some fall decorating over the long weekend. I love fall decor. 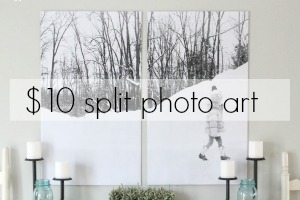 Such pretty pics! I am to ready for fall! 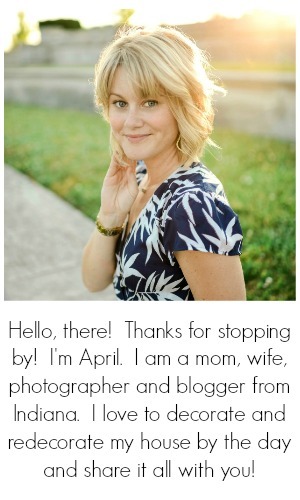 You are the queen of vignettes, April! This is beautiful! And I love, love, love that sign!! So stunning! Hope you’re having a wonderful LONG weekend! Gorgeous! Love the neutral palette with a pop of colors! Your sign is amazing!! Did you share how you did that?